Do you want to travel to Belgium and yet exercise while you are there? You need not enroll in one of their gyms. 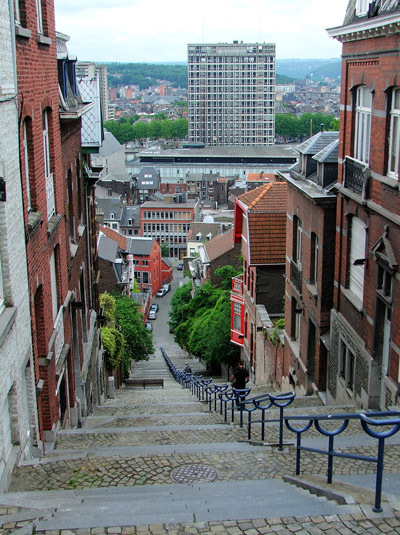 All you have to do is go to Liege City and walk through the 406 steps of Montagne De Bueren. This tall staircase was built around 1880 to allow Franchimontese soldiers to go on top of the hill without passing through the hazardous alleys around it. If you’re done going up and down Montage, you can hang out in the streets of Liege and visit the churches such as Lambert’s Cathedral, the Liege Cathedral, and the Church of Saint James. St. Lambert’s tomb is actually found in the Liege Cathedral while the Archeoforum, an archeological artwork, can be found under the old St. Lambert’s Cathedral. Tourists also like to see the Perron that stands in front of the city hall. This statue is the symbol of the city, and it used to be the symbol of justice. Besides these, museums can also be found in Liege. They have the Museum of Modern and Contemporary Art, Museum of Walloon Life, the Curtius Museum and the Museum of Walloon Art and Religious Art. Puppet shows are also very popular in Liege, as it displays the well known statue of Tchantches during its Le Quinze Août celebration in August. Legend has it that this folklore puppet appeared in the time of Charlemagne, and he was very hard-headed and rebellious. Just outside Liege is a small village called Blegny where the grounds of a former coal mine are found. These coal mines are already closed, but tourists still visit the area very interesting for sightseeing.